This Saturday at 10.30 I had the launch for the English Romanian edition of “I Wish I Were a Unicorn” book, at ToRo Fest, the most important cultural event of the Romanian community in Toronto. It was a very well organized weekend, with more than 26 writers invited and over 50 events in two days. There were several book launches of Romanian writers, two vernissages for a child prodigy and a very talented painter and also a lot of interesting panels on translating, publishing, anthropology, and gamification. 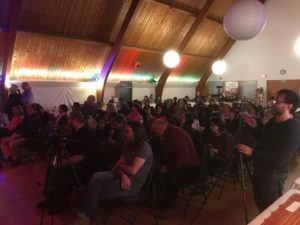 We had two very busy days and our applauds should go to Iuliana Pacso and Sorin Mitrea of Tradicious, the organizers of the event and Crina Bud, Lecturer of Romanian language and history at Glendon College, York University. 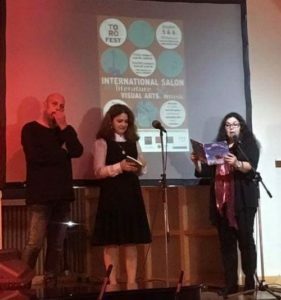 On the opening night, I was invited to read my story, together with other Romanian writers, in front of a packed room of adults and very few children. I was a bit nervous because I didn’t know if my unicorns and dragons would be able to keep a mature audience interested until the end. We keep complaining about the attention span of our kids getting shorter and shorter due to so much screen time and such an infernal rhythm of life, but we often forget that we ourselves live in a world were webpages announce how many minutes the read will take, and often we pass what goes over 10 minutes. So, how long does it take to read my story, you might ask? Well… not so long, about ten minutes. So I did give it a try, praying in my mind that people will not get frustrated with my “too many words on a page” book and leave. Well, they didn’t. They also liked my story so much that by the end of the night I have sold all the books I brought for the day (this time they were more than 5, I swear!) and I even had to tell some potential customers that I hope they come back tomorrow. 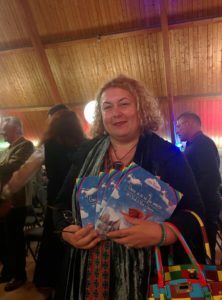 One lady came and bought 5 copies of my book, to bring them back to Romania where she has lots of godchildren that just needed to read this story. I was so happy that she considered making room in her suitcases for my hardcover books, I couldn’t breathe for a moment. The actual book launch was quieter than the public reading, but people came back to buy the book and I have to proudly confess that I sold three more books on my way out to the car, to people who followed me as I was ready to leave. That is the best compliment ever. 10.30 in the morning is a bit early for a book launch in Toronto, that is something to keep in mind for the next time. Bring change! If your book sells for 15 dollars, be prepared with 5 dollar bills. If it sells for 12 dollars, do have loonies and toonies. People get frustrated easily. There is a little device that you attach to your phone’s earphones’ jack and bam! you can accept credit cards. It’s called Square and you can get one for free when you sign up. (they do charge a 2.65% fee for every transaction so be mindful of that too). There is a lot to learn from the established authors just by watching how they put their books on display, the type of banners and stands they use. It’s useful to put a price on your books, even using little sticker dots. In the end is not about how many books you sell but who you meet and how you expand your network. The most important win of the day was that people who do not follow my blog, people who have never seen my books, people to whom I was a complete stranger before Friday night, did come up to me and picked up the books and had to think long and hard which one to buy. Because it’s not easy to choose, they are all so beautiful! Some of them told me with the utmost regret that their kids are grown-ups now and wouldn’t appreciate the book, but ended up buying one anyway. I also had a huge comeback as a journalist these past two weeks as I had the privilege to sit down with most of the participants who came from as far as Sudbury, Ottawa, Montreal, Guelph to be part of this amazing event. The interviews are posted on SoundCloud and also on the Toro Fest website, under the Radio Encounters label. I will post more interviews in the following days, as I was busy recording most of the time Saturday. I really enjoyed talking to Nina Munteanu, Miruna Tarcau, Daniela Moisa, Calin Andrei Mihailescu, Max Fraser, Stephen Henighan and David Demchuk. I have also recorded Em Sava, Felicia Mihali, Maureen Korp, and Chris Tanasescu. While I realize these names might not be so familiar to you, I can assure you they all are amazing authors, extraordinary professionals, and true scholars. So if you have the time, do listen to my podcast. I have enjoyed very much the piano concert offered by the talented 13 yo Michael Husu at the opening gala and also I loved Florin Buciu’s classical guitar recital that concluded the first night. All in all, it was an amazing experience and I am looking forward to next year’s edition. I already have another book in mind! Thank you to all my Torontonian friends who stopped by my booth! Thank you to my beautiful daughters who were a great help, and to my wonderful husband, who is just great. Thank you to all of you who read and encourage Romanian writers.